Native Shopping Ads provide highly relevant and dynamic product recommendations in a stylishly designed and responsive ad unit that can be placed at the end of your content or within your content to create a more compelling visitor experience and shopping opportunity. Recommendation Ads: Allows Amazon to automatically recommend the best matched products based on your webpage content and your visitors. Search Ads: Allows you to drive recommendations based on a key phrase. 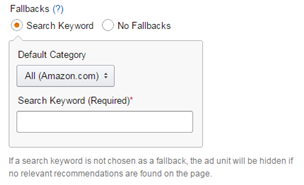 Custom Ads: Allows you to specify the products from Amazon.com that you want to promote. Where should I integrate Native Shopping Ads? We recommend that you place the ad unit within your editorial content or at the end of your articles to allow the visitors to engage with relevant product recommendations. Recommendation Ads – Integrate on all your pages by integrating into the template of the site or by creating a placement which spans across all your posts. This will allow Amazon to suggest the best set of products that monetize the most and you will not have to manually place it on each page. Search Ads & Custom Ads – Integrate on each page separately by specifying products or keywords that are relevant to the page. How do I integrate Recommendation Ads at the end of all my product posts in Wordpress? Visit the ad code creation page for Recommendation Ads. Decide where you want to place the unit and specify category hints. 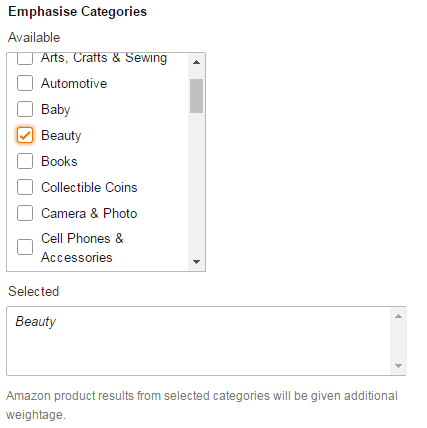 For example, if you are placing the ad unit in a section of your site which talks about beauty products, then you can specify a category hint as “Beauty” if most of your articles where you are placing the unit talks about beauty products. You can also optionally specify "fallbacks". If you want to ensure that the ad unit appears all the time, then select a set of keywords/search terms. As the title suggests, these would be typically used when the engine has nothing relevant to show to the user. You can also choose to update your advanced settings, save and copy the ad code. Note that a tracking id will be automatically generated for you in case of Recommendation Ads. How do I place it in Wordpress? Follow these steps where we show how to insert the ad unit using a 3rd party plug-in. Go to WordPress Plugins, then "Add New", and "Upload Plugin"
Then, create a block for Native Shopping Ads, and name the block for easy recognition. Paste the copied ad code as shown below. Choose the "Automatic Display" option and choose the placement. In this example, we have chosen to show it on all posts and static pages after the content as shown below. 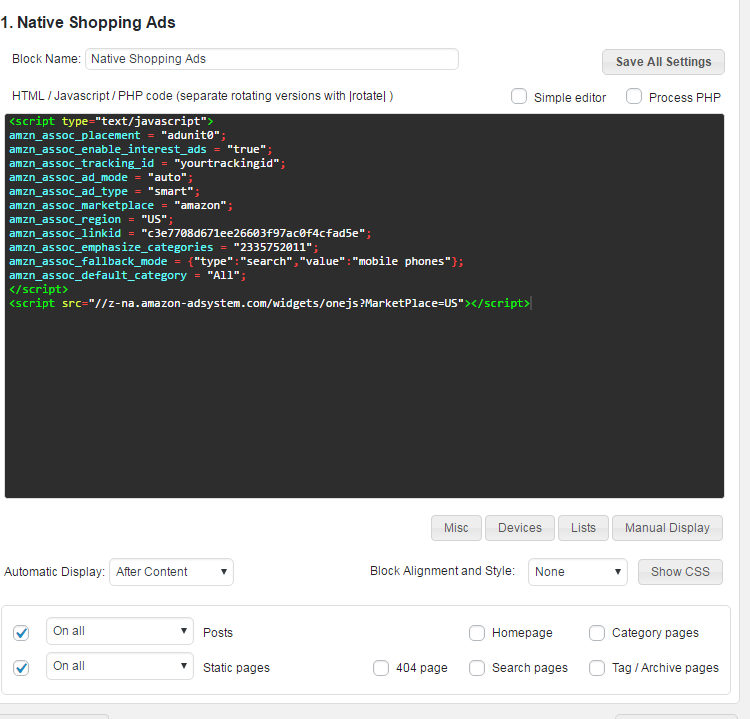 Save all your settings and visit your website to see Native Shopping Ads in action. You might have to wait for a few minutes and a couple of reloads to start seeing highly relevant ads on your site. Do you have a suggestion or comment about Associates Central website? Let us know.